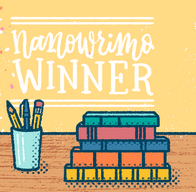 Starting today, I am embarking on the Camp NaNo month long writing challenge. My goal is to write 1,667 words a day. During these challenges, I like to use Scrivener writing software because it keeps a word count at the bottom of the screen. It also allows me to break down the project into days. In past years I went through the painstaking process of naming each day’s file, one through thirty. Only on Friday before typing this did I realize my foolish error. All I need do is create the first file and call it ‘Day’. 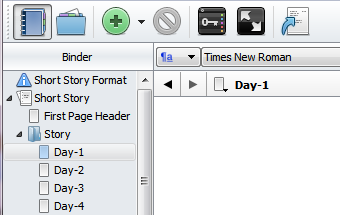 Then when I duplicate it, Scrivener automatically names the next ‘Day-1’. Upon reaching ‘Day-29’, I simply renamed ‘Day’ followed by the ‘-30’ suffix and dragged it into the correct position within the project. Ah, well, another lesson learned. That said and done, I also read again my thirteenth “BloodMoon” short story. The ending struck me as having too much exposition. That tale is also around three thousand words shorter than most of the others, plus I discovered a neat little plot twist missed in past reads. My work fun is about to begin as I rewrite the entire ending. What will stay are the last two lines of dialog, which I like just as they are. Do you tend to sabotage your own efforts and work harder than necessary? Good grief! How did Easter sneak up so fast? Happy Easter and Passover to all who celebrate! OH YES.....when it comes to working harder than I need too, and still not getting much done! haha....If you could see my house you would understand! I might not be able to write all those words in a month but I could talk them with no issues what so ever! haha....write on lady....write on. Thank you! I bet your home looks a thousand times better than mine. ~shakes head~ Hope you're feeling better today and the wedding next weekend doesn't knock you for a loop. I've done so many things the hard way when there was a much easier way. I'm the queen of doing that. At least you figured this out. Good for you. Sorry that you're in the club but it is nice to know I'm not alone. Be well and Happy Easter, my dear! Heh, you’ve seen for yourself the insane amount of work I’m doing this April. (wry grin) Good luck Camping and in exploring Scrivener in all its potential to bring your story to fruition! Hope you manage time to sleep, my dear! I have to admit that my Scrivener usage is far from optimal. Folks keep telling me about great tutorial videos but I want to write, not study technology. ~grin~ Happy Writing and Blogging! Sounds like work to me, Darla. And I could not do a fraction of your physical labors. ~grin~ I'd much rather write fiction. Thanks for all you do. And be well! Happy Easter! Why did you pick 1,667 as your daily word count? Just curious. Happy Easter to you! Actually, that count fits the fifty thousand words within thirty days. ~grin~ Other options this month were to choose shorter word counts or hours spent writing. Be well, my dear! I've heard good things about Scrivener. I have not succumbed to it, though. I'm still on Word (when I write, which has been a while...). I don't use it near to the potential. ~grin~ But switching back and forth between it and MSWord during edits makes mistakes pop out better. Heh... I hope you have a chance to get back into writing, though I know you're creative in textiles, as well. Be well!